On the Suffolk Heritage coast The Crown and Castle (above) in Orford dates back to the 16th century. The Hotel is owned and run by the legendary Hotel Inspector, Ruth Watson and her husband, and, as you'd expect, standards are first class. The Crown and Castle has 18 light, stylish bedrooms all with modern en-suite bathrooms. Although extremely quietly positioned, it is not a country house hotel in the hackneyed, ruched-curtain, prohibitively expensive sense. Neither is it efficient but soulless, in the way modern, city-centre hotels can be. Instead here you'll find a new concept in hospitality, with a genial atmosphere, good food and well-designed, simple bedrooms at modest cost. Try it and see for yourself! Golf and Spa are on the menu at Ufford Park Hotel, Golf, and Spa. This is the ideal destination for a relaxing getaway with your family. The Hotel is situated in the heart of the tranquil Suffolk Countryside and its excellent road links make it an ideal base from which to explore all the best that Suffolk has to offer, such as the nearby charming market town of Woodbridge and famous Anglo-Saxon burial ground at Sutton Hoo, stunning Constable Country and, of course, Suffolk's unspoilt heritage coastline. You'll find 87 comfortable en-suite bedrooms at Ufford Park, many of which have balconies. There are nine air-conditioned function rooms, which host our many weddings and corporate meetings, and a selection of bars and restaurants to relax and unwind in. Golfers can enjoy the challenging 18 Hole Par 71 golf course which plays host to prestigious tournaments such as the PGA EuroPro Tour, and non Golfers can relax in the Ufford Park Spa, a luxurious spa combining a sumptuous state-of-the-art thermal suite with highly trained beauty therapists to form arguably the finest Spa in East Anglia. Hintlesham Hall Hotel, above, is a Grade 1 Listed Elizabethan Manor House nestling in 175 acres of rolling Suffolk countryside. Widely recognised as one of the loveliest amongst the UK and Ireland's highest rated hotels, the Hall has 33 bedrooms and suites of varying shapes, sizes and styles enhanced by fine fabrics, works of art and antiques. Here you'll find friendly professionalism and the list of available activities is substantial although the heart of Hintlesham Hall is the opportunity simply to relax and perhaps wander around the grounds or countryside before enjoying Chef's latest menus and depleting the award winning wine cellar. Health & Beauty and other specialist treatments and a fully equipped gym with helpful instructors complement the pool (in season). 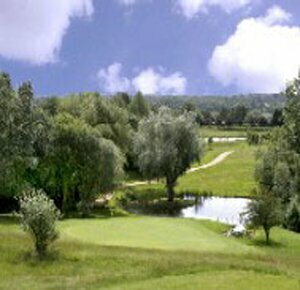 Adjacent is the associated championship size PGA golf course. Relax at Kesgrave Hall (above), near Ipswich, where you can find all day dining and picturesque grounds, so stroll around and then settle down to a great meal. The bistro restaurant serves inventive food alongside classics such as delightful fish and chips, with a buzzing but relaxed atmosphere and wonderful service from a friendly and professional team. Call them now to book your break! One of Suffolk's many gems is Lavenham, a picturesque and unique timber-framed Medieval village. With old timber-framed houses, the fine Perpendicular 'Wool Church' and a High Street full of antiques shops and Art galleries, Lavenham is a 'must see' in any tour of the prettiest villages of East Anglia. 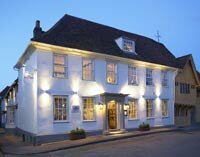 You will be spoilt for choice for Hotels as there are two outstanding Country Hotels in Lavenham. The Great House is a small luxury boutique hotel in the middle village that offers high quality accommodation and outstanding French food. The Great House pictured above, can be found in the market place of Lavenham, the centre of the Village. It was a private house until Regis and Martine Crepy converted it into a 5 star luxury boutique hotel with restaurant in 1985. The restaurant is predominantly French and is one of the best in the East of England. There are just 5 luxury ensuite bedrooms, each individually furnished and retaining the character of this charming, ancient building. Find out more by clicking on the link above. Enjoy Lavenham and the surrounding countryside at these great hotels. 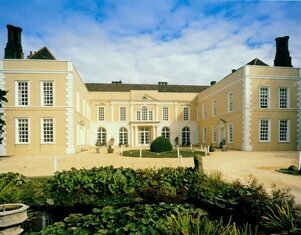 Please send reviews of your favourite country hotels in Suffolk to suffolkguides.admin@suffolktouristguide.com.